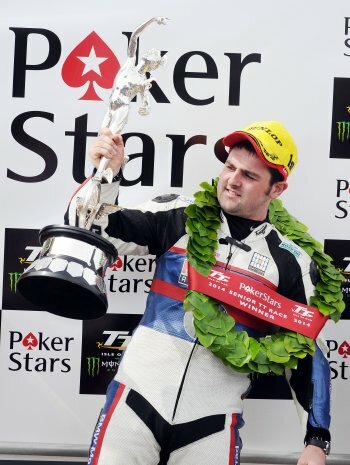 Michael Dunlop joined Steve Hislop and Phillip McCallen on 11 wins at the Isle of Man TT Races fuelled by Monster Energy when he took Friday afternoon’s PokerStars Senior TT race, the second year in succession when he’s won 4 races in a week. The BMW Motorrad rider was down in seventh at Glen Helen, the first timing point, on the opening lap but steadily moved through the leaders on the opening lap. He eventually took the win by exactly 14 seconds from Honda Racing’s Conor Cummins with the Tyco Suzuki of Guy Martin in third. With conditions all around the Mountain Course remaining perfect throughout the 6-lap race, the second Tyco Suzuki ridden by William Dunlop held the lead in the early stages, ahead by 1.3 seconds at Glen Helen with Cummins and Martin in second and third from Dean Harrison, John McGuinness and James Hillier. William still led at Ramsey but Michael was beginning to make his move, closing the gap to just one second and by the end of the lap Michael was in front. His lap of 130.628mph gave him a 0.8s lead over Martin with Cummins, William Dunlop and Harrison in hot pursuit, just 3s covering the top five. On the second lap, Dunlop and the BMW really began to make their mark on the race and with a new lap record, for the Senior race, of 131.668mph, he went 7.7s clear as he came into the pits for his first stop. William had edged out Martin for second as Cummins slipped back to fourth. 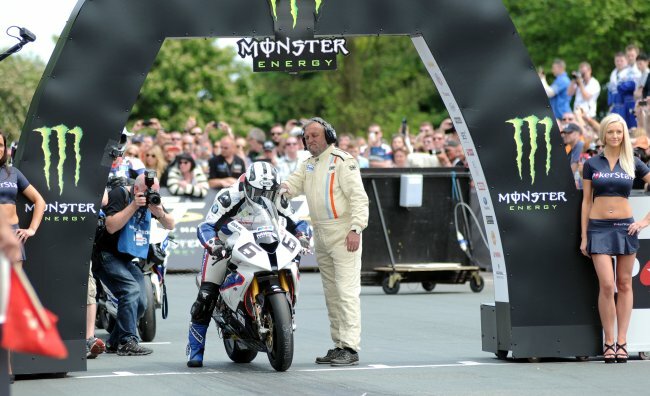 Harrison remained in fifth as a slow starting Bruce Anstey moved up to sixth. Lap three saw some major changes though and while Michael remained in the lead, Cummins and Martin moved up to second and third respectively as William Dunlop crashed at the Les Graham Memorial, the 28-year reported to have received a suspected broken leg and was taken by airmed to Nobles Hospital. Harrison was also out, retiring at Sulby. 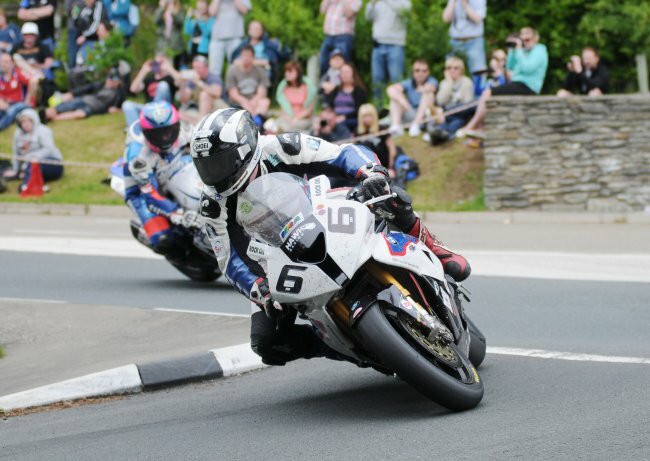 The gap between Michael Dunlop and Conor Cummins went up to 13s at Ramsey on the fourth lap, but by the pits and the second stop, it was down to 9.5s as Cummins was the quickest on the fourth lap at 130.499mph. Martin was 10s further back in third, with Dunlop having caught him on the road, as Anstey, Hillier and McGuinness now slotted into fourth to sixth. At Glen Helen on the penultimate lap, just 7s separated Dunlop and Cummins with the former circulating on the road with Hillier, McGuinness and Martin also encountering heavy traffic. However, the Ballymoney rider fought his way to the front of the quartet and once there he was able to build a slightly more comfortable lead. By the end of the race, the margin was 14s as he swept to his 11th win of his relatively short TT career, with Cummins again justifying Honda’s faith in him in 2nd, 9.6s ahead of Martin who had to settle for third and his 15th TT podium. Just like twelve months ago Anstey and Hillier battled all the way to the chequered flag, this time for fourth, and it was again the Kiwi who prevailed, this time by 1.4s. Meanwhile, McGuinness, sixth at the end of the opening lap, duly completed the race in the same position to end a difficult week with a solid finish. Josh Brookes put behind the disappointment of Wednesday’s Supersport race, when he was knocked off by Lee Johnston at Creg ny Baa on the final lap, to finish in a strong seventh with Dan Kneen, Michael Rutter and David Johnson rounding out the top ten. There was another sensational performance from newcomer Peter Hickman who not only took 11th place but also set the fastest ever lap by a first timer at the Mountain Course with a stunning lap of 129.104mph. He was the first privateer home ahead of Ian Mackman (15th) but Ivan Lintin’s 16th place was enough to see him wrap up the TT Privateer’s Championship with 97 points overall. John Ingram and Philip Crowe were reported off at Governors and Gooseneck respectively but both were reported as OK. Martin Jessop, also off at Governors, was taken by ambulance to Nobles hospital with a suspected broken collar bone, while Austrian Horst Saiger was conscious after an incident at Gardeners Lane and taken to Nobles with a leg injury.